Solid build construction and a powerful processor are let down by a lack of solid state storage, unreliable flip detection and a slightly dark screen. With the release of the latest MacBook, Apple proved unwilling to dip its toes into touchscreen laptop territory just yet – leaving the market open for Asus and Lenovo to do a few backflips into the pool and make some big waves. This, the latest from Asus' (slightly confusingly named) Transformer Book Flip line features the new i7-5500U Broadwell Intel processor, beating its nearest rival the Lenovo Ideapad Yoga 3 which still currently has an i5-5200U. The Core i7 version of the Transformer Book Flip (model DW176H) we reviewed costs £600 (around $940, AU$1,180), so it's currently cheaper than its competitor. The advantage of the Yogas is that they have hybrid hard drives or SSDs, while this model does not, and I'll get onto that a little later. The Microsoft Surface Pro 3 is arguably a better stab at the laptop/touchscreen hybrid, as it keeps all the processing power and screen in one unit. 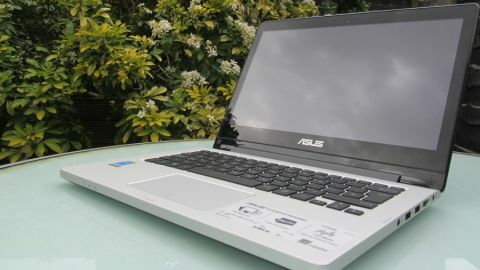 The Asus TP300LA is a more traditional laptop setup with all the gubbins in the keyboard section and an attached screen on a hinge that allows it to flip all the way around. With that in mind, this is a model for people who actually want a laptop, haven't already got a tablet and would like a touchscreen. Don't expect this to replace a Nexus – but considering that this is the price of a high-end iPad Air 2, and it's a working computer with all the bells and whistles that brings, it's a very good deal. Asus appears to be aiming this at people who travel or are on a medium budget but don't want to compromise on style or functionality. It's also aimed at users who want more power than what's currently on offer from the lower-end of HP's Touchsmart laptop range. This machine is better built – it's less plasticky and more powerful. Looks-wise, Asus is aiming high, tickling the underbelly of Apple's MacBook Pro. The body around the smart black keyboard is brushed metal and feels incredibly sturdy. The screen is backed with matt black aluminium, it's pleasing and doesn't allow for much screen bend, despite the prodding it gets from being a touchscreen. The underside is made from black plastic, but this is well hidden and isn't a design issue. The clever design of this laptop means the screen can be flipped all the way round to make it into an admittedly bulky tablet. And just like Lenovo's Yoga line, this can also be used in tent and stand modes. Upon folding the screen into stand mode, Asus' FlipLock software kicks in with a reassuringly soft doorbell sound which indicates that the keyboard has been locked and input can now only be done via the on-screen keypad that pops up. This means that nothing will be accidently set off when it's rested on a table or lap. The on-screen keyboard can be accessed anytime by pressing the small keyboard icon near the Systray in the bottom right. The physical keyboard can feel a little vulnerable when in tablet mode. The machine is also way too bulky to hold as a tablet for any length of time, so tent and stand mode come into play more often than not. I often forgot it was a flipping notebook (so to speak) when using it and had to remind myself several times as I'm more used to traditional laptops. However, after forcing myself to use it, the touchscreen and flipping it around became intuitive and useful. Unfortunately though, mid-way through the testing session the FlipLock software refused to work making it impractical to use as anything other than a standard laptop. So by the end of the review I was just testing a standard laptop with a touchscreen. A reinstall and reboot did not solve the problem. Travelling is where the flipping ability comes into play. On long journeys flipping the laptop makes watching movies and TV shows easier with the keyboard resting flat on your lap. Tent mode can be used on small tables, although the plastic and metal edges means it can slip around if the going gets bumpy. The Flip's sturdy construction also means it's great for people who move around a lot, but weight is also a consideration which I'll come back to later. There's an HD Webcam in the top centre of the screen meaning it can be used in both modes. We had a few chats on Skype and Google Hangouts and it took everything in its stride. It doesn't work that well in low light, but its function is just for chatting rather than taking photographic masterpieces.